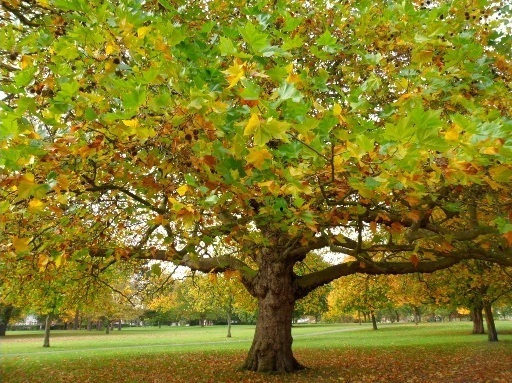 This is the last post about london plane trees in this series of Seasonal Celebrations linking up to Donna's meme. Last season she shared in return a photo of her ash trees, explaining how they have been struck by a disease which means some have to be put down and asked for our suggestions of suitable replacements. You can guess my first thought, but then I remembered an article I'd read about a new disease which was attacking them too - massaria. 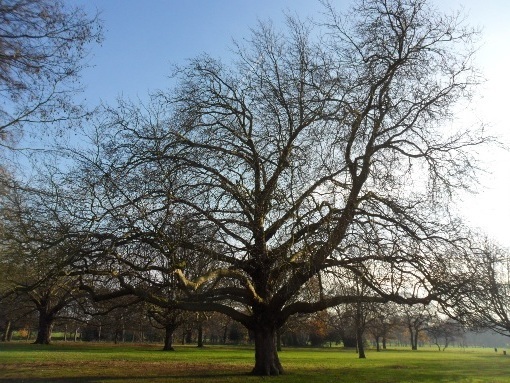 This disease has already damaged some branches of plane trees in London's Royal Parks but at least it doesn't kill off whole trees. I wondered what it would be like to take a peaceful ride on a canal boat shaded through the entire journey by plane trees on both sides and resigned myself to the fact that it wasn't a possibility any more. 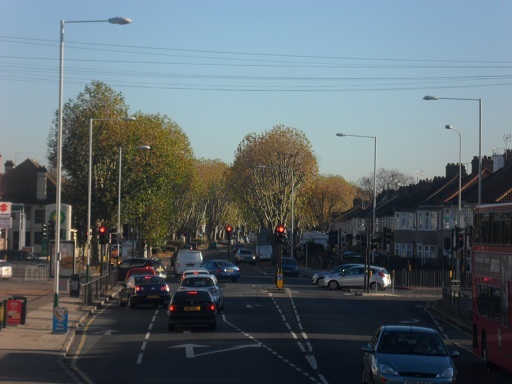 Then on a sunny day in mid-October I was perched on the front seat of a double-decker bus when I saw trees in the distance which made my heart skip a beat. 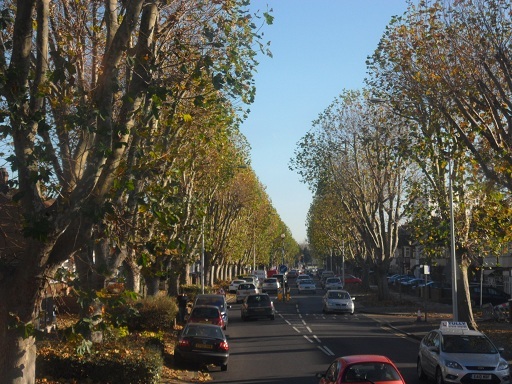 To my delight they were banks of plane trees which had been allowed to grow more fully than their brethren which usually line our suburban streets. Cruising by in a stream of traffic was a surreal experience (though the other bus passengers didn't seem so affected!). Those were fine trees indeed, but in comparison it seems difficult to believe that a favourite tree in my local park is of the same species. There wasn't much to report between summer and autumn but as autumn changed to winter, I visited often to make observations. They turned pale yellow then dried and fell quicker than the surrounding trees still celebrating their autumn glory. 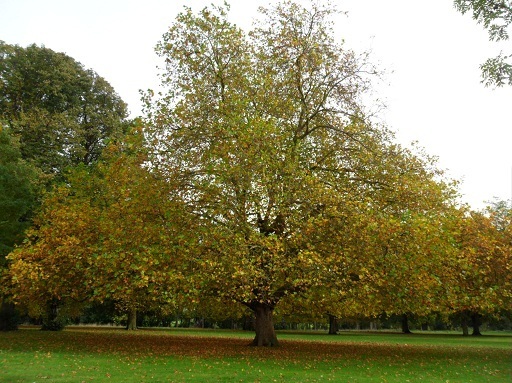 However, the plane tree doesn't let go of its dark-brown, prickly, round seed clusters as the wind will determine their destiny. 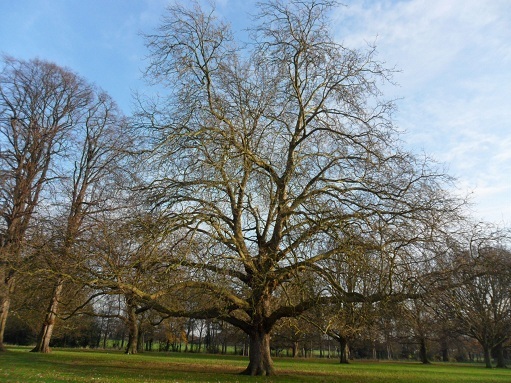 By mid-November, most of the leaves formed a thick carpet around the tree and its magnificent framework was revealed. After a few windy days (or a clean-up by the groundsmen), the carpet had disappeared. 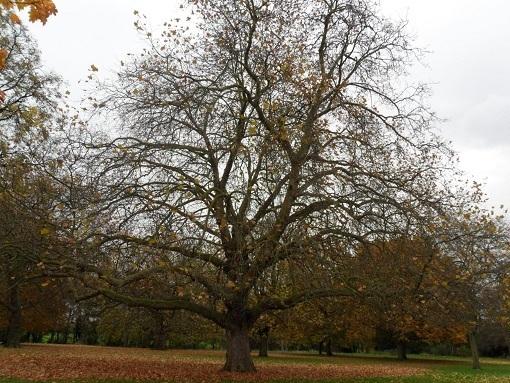 The tree is certainly not shy to be naked now, presenting its symmetrical form as one approaches, the lower branches bearing a resemblance to the Angel of the North. ... but if you turn back, you'll catch a glimpse of its mischievous off-balance persona. This tree has taught me many things during my visits this year, but most of all it made me realise that you don't need to own something to love it. Today I'm linking up with Donna Abel's meme : Seasonal Celebrations... and Lucy & the tree followers at Loose and Leafy. The contribution of this reliable, tough, and statuesque tree to the city scape is undeniably high! Sad to read. Those old trees are really beautiful in parks. Thanks for the history too, I was unaware. 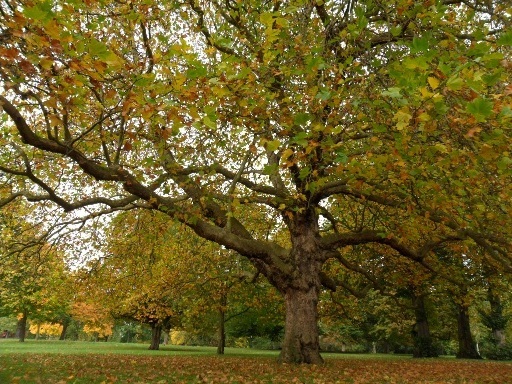 So sorry to hear about the fungus destroying thee magnificent trees. i hope many will survive. Who would have thought a deadly fungus would hitch a ride in a wooden box? The views of the tree changing with the season are great! Have a wonderful Christmas, and i hope your garden prospers in 2013! You are the Tree man b-a-g and those ones on the busy road are magnificent. A great shame about the disease. Keep up the good work next year and have a great Christmas. What a beautiful tree, and the street lined with them is just lovely. I bet even non-gardeners realize what a lovely view they are seeing, even if they hide it. Sad to hear of all the diseases affecting our plants. It makes me wonder what our gardens will look like in the future. I hope your Christmas is merry. Thanks to Donna's meme I feel like I have developed a relationship with this tree. I just noticed it in passing before.